Progress on the Megaboss is a bit slow at the moment but things are ticking along. I've removed the jaw guard, and trimmed it down so more of the face is visible, before reattaching it at a lower angle. I liked the design but felt it was just a bit too big & bulky and it covered up a lot of the face. Painting Orks is easy isn’t it? After all they’re just green. It is, of course, never quite that simple. If I were painting a human I’d expect to put all sorts of nuances into the flesh tones so why should Orks be any different? Rather than painting my ‘greenskins’ with an all-over even skin colour, I’m going to try to introduce as much variety as is reasonably possible, given the scale and available areas of flesh. A non-human skin tone could reasonably be expected to use a different colour palette and follow different rules. However, by applying some of the same principles to Ork flesh that I would to human flesh, I should be able to bring a touch of realism to the fantastical! Do Orks tan? Have some areas had more exposure to the sun than others? Perhaps the upper side of the arms, or the neck and shoulders, could be a darker or more saturated tone? Similarly less exposed areas could be paler. 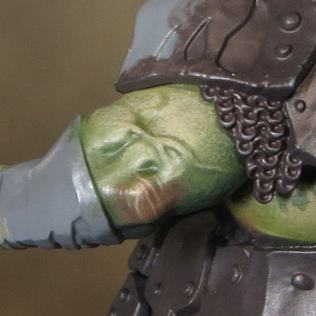 Why couldn’t Orks be striped, spotted or even just freckled? Such markings needn’t appear all over and don’t have to be in a contrasting colour. A subtle (or not so subtle) skin pattern would add a lot of interest and character. Further to this, it seems unlikely that all Orks would be exactly the same shade of green. It makes sense to me that Ork flesh tones would be just as diverse as those of humans. Possibly more so! What colour is Ork blood? This has a lot of bearing on the apparent flesh colour and, in some areas of thinner flesh, the blood might show through. In this case it could be a useful ‘cheat’ to assume that Ork blood is red(ish) and include a red/pink/purple tone in some areas like the face, elbows and knuckles. Similarly the tonge and inside of the mouth could incorporate this colour. A red that is closer to a purple than it is to orange may harmonize better with green. This is because both colours will contain some blue. For the purposes of this project, I’ve decided that Ork blood is indeed a red/purple colour and all the green comes from pigment in the skin. Death World Green is the core colour in my Orc flesh tones and it’s a colour I’m really enjoying working with. I’ve found that it mixes well with the other colours in the palette to unify the range of colours and tones. Vallejo Dark Sea Blue, GW Rhinox Hide, Scalecolour Sunset Purple. You can’t beat Dark Sea Blue! Here it provides a dark blue/green for the shadows that contrasts well with the yellow green of Death World Forest. Rhinox Hide is a really useful colour to use in combination with Dark Sea Blue. Mixed together they produce a very dark neutral tone that can be used instead of black for the darkest shadows. I used a lot of this combination on my Tomb King. The purple can be used as a glaze to add a little interest and colour contrast to the shadows. GW Death World Forest, Scalecolour Sherwood Green, Scalecolour Blood Red, Sunset Purple. This is where the more saturated colours come into play. I’ve used these colours, in various combinations, as glazes to add some depth and interest. The red, in particular, can be used to create a focal point on the face and helps to give life to the mini. GW Death World Forest, GW Death World Forest & Rakarth Flesh mix, Vallejo Ivory. Highlights pull everything together by increasing definition and contrast. 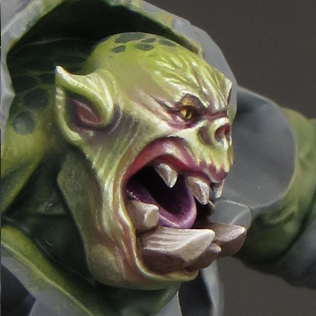 I’ve pushed the highlights on the Megaboss’s face to a fairly extreme level. This is so his face will still ‘pop’ and remain a focal point once the enormous visor is in place. I doubt I would go quite so light and bright on most other Ork minis. With the flesh just about done I thought it would be a good idea to work on the base before I did any more painting. Making a base can sometimes involve repeatedly testing the fit between it and the mini. Such was the case with my Megaboss, so I thought it best to get the base built while there was plenty of bare plastic that I could safely handle. The most noticeable thing about the Megaboss is the dragon skull strapped to his shoulder. That combined with GW’s description of how the Ironjawz will ‘bring down whatever enemy (or object) has the temerity to be bigger than them” gave me a starting point to. This guy is a slayer of any beast or monster he comes across, so I’m going to reflect that in the paint scheme for his armour. I’m also representing it quite literally on his base. The 60mm round base that comes with the mini provides plenty of room for scenic elements and, in addition, I decided to raise the Megaboss up on a rocky outcrop. It’s a bit of a cliché, but I’m positioning him with one foot up on the recently severed head of a Dracoth. If there was ever a mini that calls out for a dramatic base it’s this one! I’ve used tree bark, foraged during a country walk, for the rock. The bark has a bold crack down it’s middle and a gnarly texture that should work well on the base. I found it necessary to stabilise the bark with an application of superglue as it was quite crumbly. Slightly rotten wood often has a very interesting texture but it can be fragile! The Dracoth head was trimmed down to fit the base and then given a new neck with parts from my bits box and green stuff. Any gaps were then filled in with milliput to stabilise and strengthen the construction. Because I was able to make multiple test fittings, between the Megaboss and the base, I’ve managed to ensure a good fit and some interaction between the mini and the base. I’m particularly pleased that I’ve been able to create a slight bulge in the Dracoth’s neck where the weight of the Megaboss’s foot is bearing down on it! It’s been thirty-two years since I last painted an Ork! My teenage self rather enjoyed painting Orks ... with blue/grey flesh! But as time passed, and Games Workshop developed a distinct identity and style for their Orks, I found other models (mostly Chaos and Elves) more appealing. I didn’t particularly buy into GW’s vision of, to my mind, big chunky Orks. Professor Tolkien had gotten to me first and, in my mind, Orcs were mostly lean and wiry creatures much as they eventually appeared on screen in Sir Peter Jackson’s films. So when the new Ironjaws Orruks, as we must now call them, came out I should have hated them on sight. These are the biggest and chunkiest Orks Orruks yet; but I love the outrageous boldness of them! Most of all the new Megaboss, who screamed out to me to be painted. So moving on from all things Nurgle I’m painting … green flesh tones again! Of course, it’s a different sort of green flesh; so I’ve been trying out a new combination of colour to those I would use for Plaguebearers. I’m starting with a base colour of Death World Forest. This gives me a slightly desaturated yellow/green tone that works well in combination with my old favourites Rackarth Flesh and Dark Sea Blue. I’ve got some fairly ambitious plans to paint free hand decoration on the armour, but more on that later. In the first instance I decided it would be best to start painting the flesh before all the armour is glued together. There are some very hard areas to reach on this mini. I’ll be partly covering up some of my early work, once all the armour is on, but at the least I’ll know it’s there.